If you're an environmentalist or a lawyer, you've got to love how U.S. District Judge James Redden has handled the lawsuits over management of the Columbia and Snake rivers for threatened and endangered fish. He has followed the deeply flawed Endangered Species Act to the letter. He has rejected and modified plans and ordered scientists and managers to jump through hoops and spill water over dams for 11 years now, and he'll probably do it for years to come. Or at least until 2013, when he wants a better plan in hand. To listen to the legal arguments, you would think the last salmon was about to wash ashore at the foot of the Bonneville Dam and that we need to pull out all of the stops -- and dams -- to rescue these poor creatures. That's just not the case. According to even Earthjustice, the environmental law firm that sued the federal government, things really are improving for the fish. "The Columbia-Snake River Basin is witnessing the biggest sockeye salmon return since at least 1938," Earthjustice boasts on its website. "Scientists also credit this spill with significantly contributing to a chinook salmon return currently 140 percent above the 10-year average." In other words, the fish are doing much better. Apparently, though, success is not enough. They want the federal government, in the form of the National Marine Fisheries Service, the Bonneville Power Administration and the U.S. Army Corps of Engineers to rewrite their biological opinion to include even more projects to "save" the fish. A biological opinion is a 10-year plan for actions or projects that will help the fish. It includes habitat restoration, spilling water over dams at key times and other steps. The ESA is so poorly written as to require a list of specific projects going out 10 years. The most recent opinion only went out five years, pending assessments of how the fish were doing. The judge ordered the agencies to look into their crystal ball and guess what other projects -- and money -- they'll have for the fish. As taxpayers, we all should be aghast. In the 2008 biological opinion, the BPA, Corps of Engineers and the Bureau of Reclamation committed to spending $933 million to help the fish; Washington state and the federal government committed an additional $45 million over 10 years; and the federal government committed $61 million to the Shoshone-Bannock Tribes for habitat restoration. But wait, there's more. The federal government is outspending even those astronomical numbers. According to the U.S. Fish and Wildlife Service, from 2005 to 2009 the federal government spent more than $1.1 billion on saving Columbia and Snake river salmon and steelhead. In 2009, of the more than 1,000 endangered and threatened species the federal government has listed, Columbia and Snake river fish were six of the top 10 species when measured by the amount of money spent on them. About 30 percent of wholesale power rates BPA receives goes to fish restoration. 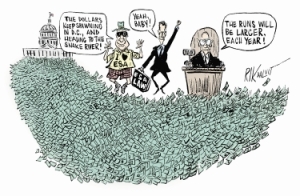 If Earthjustice has its way, and the judge has his way, the federal government -- that's us -- and the electricity users -- us again -- will pile billions of dollars on top of well over a billion dollars already been spent on fish. Congress -- which, by the way, is broke -- simply cannot afford to be the deep pockets for the environmental dreams of radicals. The idea of taking out four lower Snake River dams, as the judge suggests should be considered, represents billions of dollars more. Maybe Earthjustice, the Sierra Club, American Rivers and all of the folks who want those dams out could have a bake sale to pay for removing the four dams and the impact that would have on the region's economy because of the loss of transportation options and electricity. The four dams provide enough electricity to power 730,000 homes for a year. Combined, all of the Columbia and Snake river dams provide 72 percent of the region's electricity. This is yet another example of the Endangered Species Act at its absolute worst. It's "saving" fish that don't need to be saved, threatening the region's economy and spending billions upon billions of dollars in the process. That's a law Congress must repeal, or at the very least, modify to take today's realities into account. We simply can't afford it.